!!! A vital addition to the tool kit of any IT professional !!! 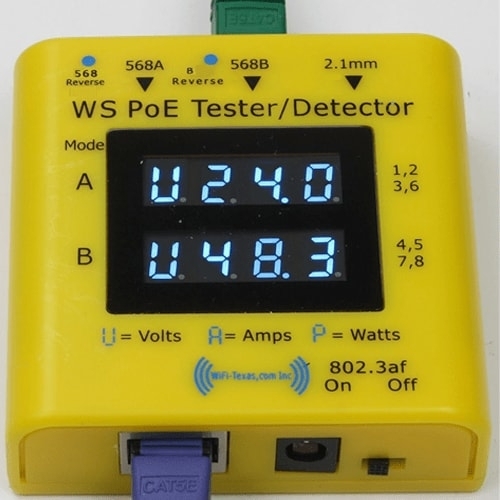 Connect the PoE tester Source side (Top) to your switch, injector, or power supply. If the tester does not power up immediately and you see a yellow LED light, move between the 568A or 568B inputs to see which polarity works for you - see Polarity section. Connect the Load side (Bottom) to your PoE enabled device or powered device for the DC port. - Display B and A can operate at the same time with different supplies in full isolation. A PoE switch or injector may provide power on all 4 pairs of the Ethernet cable, in which case both displays will activate. The power will be the sum of the two displayed values. Every 3 seconds the display cycles to a different parameter. U indicates Volts; A, Amps; P, Watts. 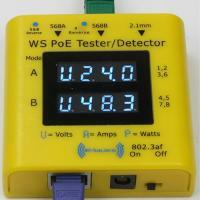 The display range is up to 280 watts with a 56 volt, 5 amp supply. See specifications for more details. 802.3af Pass-Thru Mode - Set the 802.3af switch to OFF. If the source is an 802.3af or 802.3at switch, then there will be no indication until a compatible load device is connected. Once an 802.3af or 802.3at device is connected, the display will start to show Volts, Amps, Watts. 802.3af Simulate Mode - Set the 802.3af switch to ON. If the source is an 802.3af switch, then the display will be active even without a load. Once any load is connected, the display will start to show Volts, Amps, Watts. The switch adds a 30014w load to the power reading so you should turn it off once an actual load is applied. DC connector - A power supply can be tested with this device. 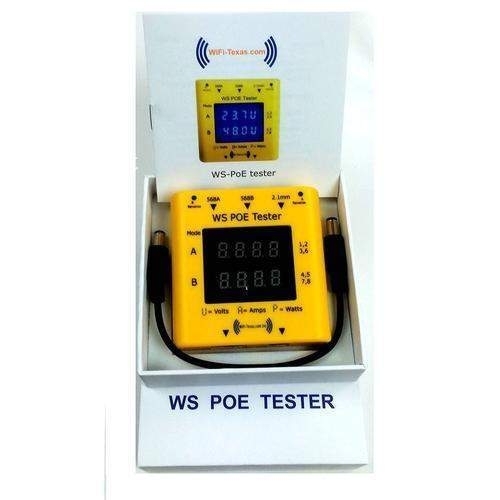 Connect the 2.1mm Source connector to the PoE tester, the voltage will be displayed. Connect the load side to the device to be powered with the 2.1 mm jumper included. The results will be displayed on the Mode A display. * it is possible to use the DC connector and Mode B at the same time. USB voltage Tester - please see our 5v USB inline tester for 5 volt USB applications.